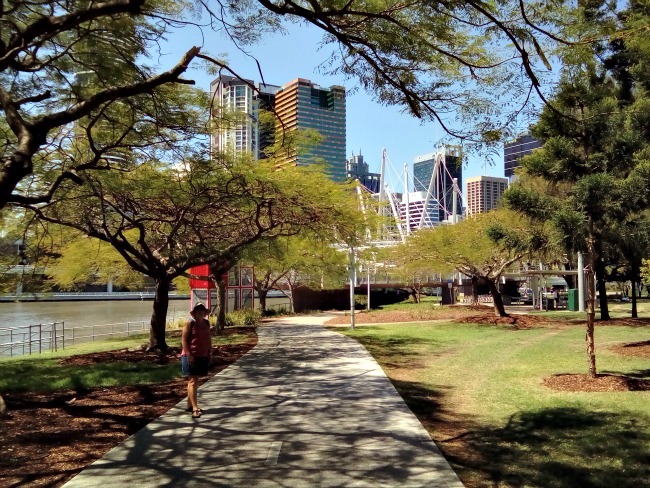 Is Brisbane the best city in Australia? 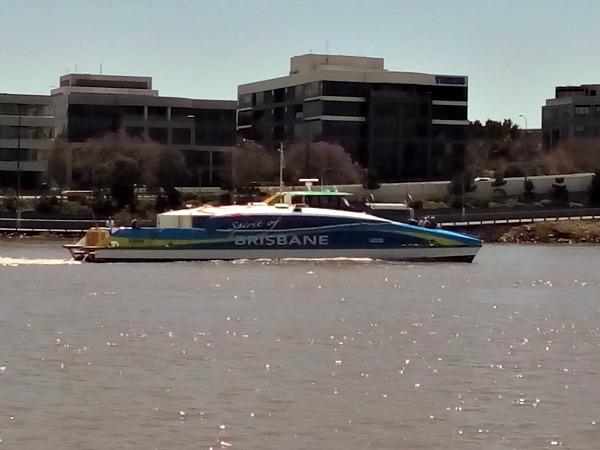 Even though Jon gave you a brief taster of Brisbane at the end of the last post, this is the first full one from the city of music on the winding Brisbane River. Our arrival this time was at the more reasonable time of 6pm rather than our 5am arrival in Cairns. We are hosted by Louise and her son Orlando who is 7 years old. 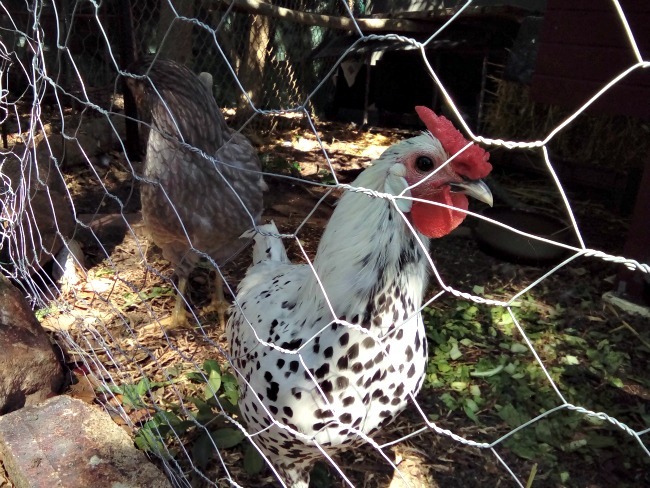 She has a large ground floor apartment with an even larger outside terrace full of herbs, plants and she even has a chicken coop for her hens. After a quick tour round, Louise explained that she had had her hens about 4 weeks and when the hens were small she did not realise that one of them was actually a rooster. She took us out in the dark to see this huge, and I mean huge cockerel. 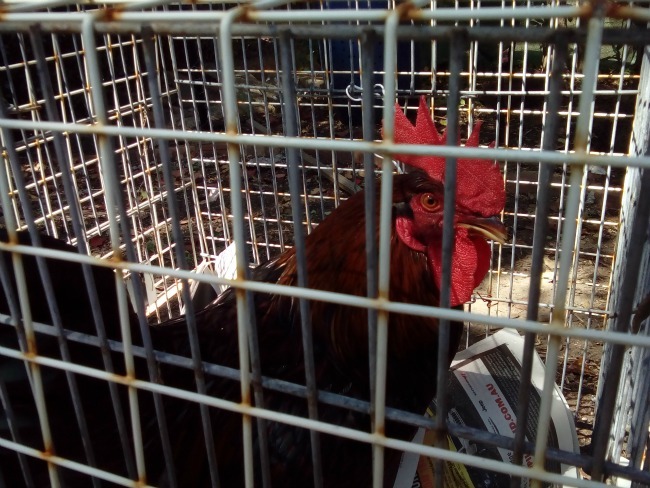 But his days were numbered, it is against Brisbane City Laws to have a rooster in the city due to the noise. She also showed us the possums hiding in the tree in the dark. These look like half squirrel half cat and are wild. They nest in the trees and come down to her terrace for food. Louise prepares some vegetables and fruit for them each day. When it gets really dark all you see is two or three sets of twinkling eyes and all you hear is the crunching of celery of whatever supper time treat they are munching on. Whilst on the subject of wildlife it brings me neatly to the warning that Louise gave us that a variety of local birds (butcher birds, magpies and a few others) are nesting at the moment and get very protective. They, therefore, have the habit of swooping down and pecking the heads, eyes, faces of pedestrians and cyclists. There are large warning signs to give you warnings of areas that these attacks have taken place and advise you to wear a hat and carry a magazine or newspaper to wave them away. The line of defence taken by the cyclists is to wear their helmets with plastic spikes velcroed to the top. Despite our walk through a high risk area on our first day, we avoided detection – maybe they knew we were quiet, well spoken English types. (Swooping Bird Alert). After three mornings of the rooster alarm, Louise asked Jon to get the rooster in a cage so she could return it to the farm. Jon did not look keen and went very pale. Luckily she had a friend who keeps chickens so he came and put him in a cage that would fit in the car. Even though he was experienced in handling wild fowl, he looked a bit weary. No sooner had the rooster departed before the alarm was raised that there may be a second one masquerading as a hen. What do you think? No doubt we will find out at 5am tomorrow. 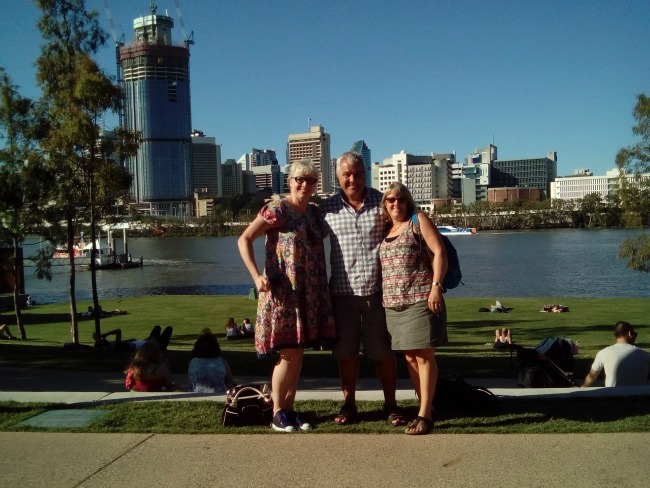 We had a bit of a cultural day on the South Bank of Brisbane on our first outing. The South Bank is a bit like the one in London, a series of galleries, theatres and meeting places, only with more space and generally much nicer. 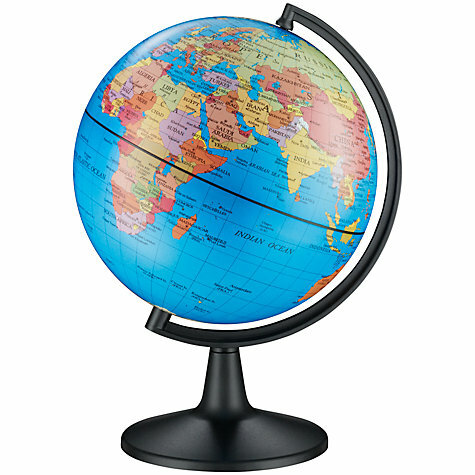 There is even a wheel similar to the London Eye. But one thing London doesn’t have is a lagoon to have a refreshing swim in the city centre. We visited the QAGOMA (Queensland Art Gallery of Modern Art). We are afraid that some of the artwork in the galleries was beyond our interpretation. In Jon’s words, “I am either really thick not to appreciate this desk with a load of rubbish on it, or someone is having a right laugh at our expense.” We looked through about 4 galleries then moved onto the library next door which had a poster highlighting a special exhibition called “Distant Lines”. It was all about postcards and communication during the first World War from Australian troops to their families. It was really interesting to read things from a different perspective. There was also a lot of information on the recent 100th anniversary of Anzac Day (Australian and New Zealand Army Corps) 25th April. It is a day of national remembrance for those lost, injured and affected by all wars since the first deployment of troops to Gallipoli in 1915. Having topped up on culture and history. Day 2 in Brisbane saw us in the city centre. There is a very strange mix of traditional and modern here. There are very few original buildings. It is as if someone one day decided that they had gone too far, so they had better make something of the one or two remaining. 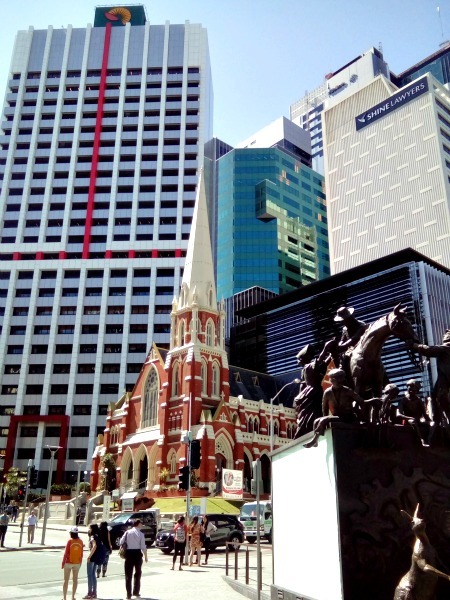 The monument to the right of the church is the Petrie Tableau in King George’s Square which is to commemorate the pioneering spirit of Andrew Petrie in the 1800s. There are also a couple of lions similar to those in Trafalgar Square guarding the City Hall only slightly smaller. 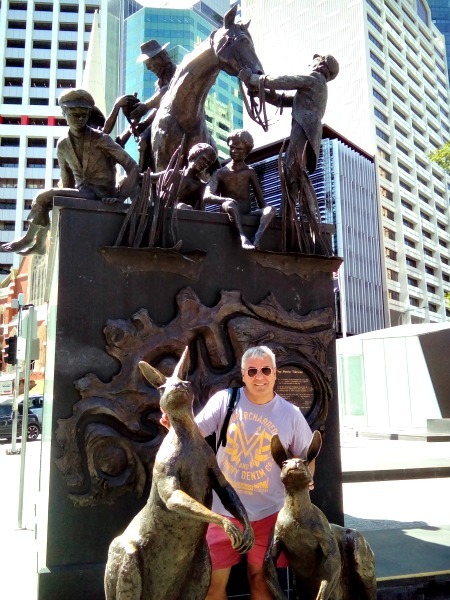 We then walked through the city listening to the buskers as we headed to the Botanical Gardens and found a bit more wildlife. 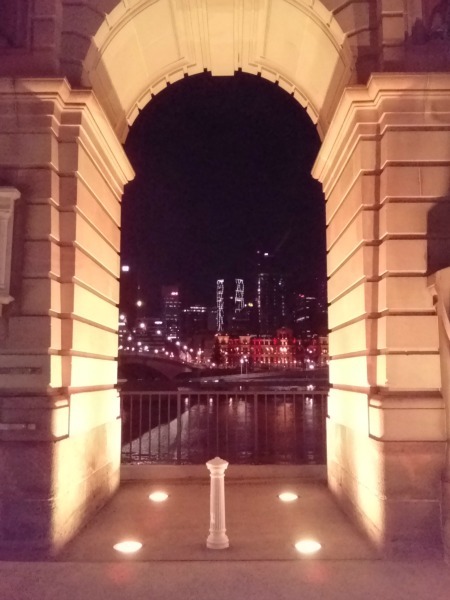 After some more exploring, including listening to a sound check for a heavy rock bank playing in the city that night we caught the Citycat river ferry back to our part of town. These ferries, zig zag at top speed up the river to various landing stages and are the same price as taking the bus. It is a lovely way to travel to work or for a day out. We had a quieter day next and met up with Helen. Ryan’s girlfriends Mum. We met on the South Bank and chatted over a couple of drinks. It was a lovely afternoon (hope your ears aren’t burning Ryan and Ella) and we are meeting up again for a day out before we leave. We ended up with the day watching some street entertainers – a lady who kept saying she was going to set herself on fire but didn’t and a very very good juggler. Jon is quite good at juggling and he is going to start practicing again. Might be a way of earning a few pennies on our travels…..
We ended up with a walk along the river bank and took another one of those old to new photos. This post seems to be full of photos from the mad rooster to life in the city. It is not all go, go, go – we do have the odd moments flaked out on the grass but I wouldn’t be so mean as to get photographic evidence like someone I could mention! 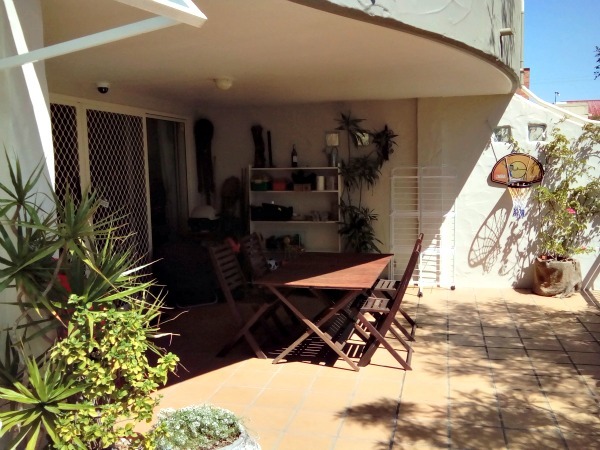 Don’t worry I will get my own back…… Finally, we don’t know if you read about the Airbnb case this week where a couple booked a whole house for a week and used it to set up a “pop-up” brothel (oops a double entendre!). Well if the juggling is a no go it could be Pimp Jonno and Madame Josephine. 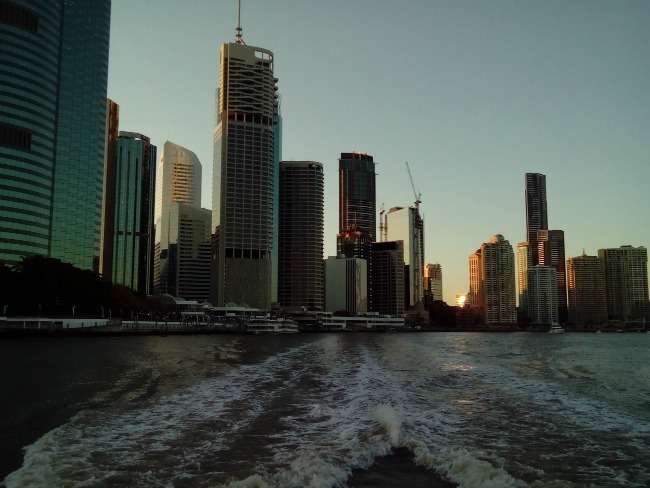 Next stop – Adventure Stories from Brisbane. Come on! Even the City Council are encouraging you to wear a hat! Cool looking place. Could you imagine the carnage of a lagoon on London’s South Bank! As you’ve now been in Oz almost a month I need to know if you’ve heard anyone use the phrase ‘Flamin’ Galah!’? Loving the blog as always. City Council have been obeyed. Hat photo taken and downloaded ready for next post! The wait is worth it because there are other accessories! Now we have got you thinking! Not heard the FG phrase yet – do tell more. I can’t believe that there is not a picture of you dodging the birds with a clamping hat on! My clamping hat is in the wash Lydia !!! Ha! Supposed to be Glamping, Damn spellchecker! 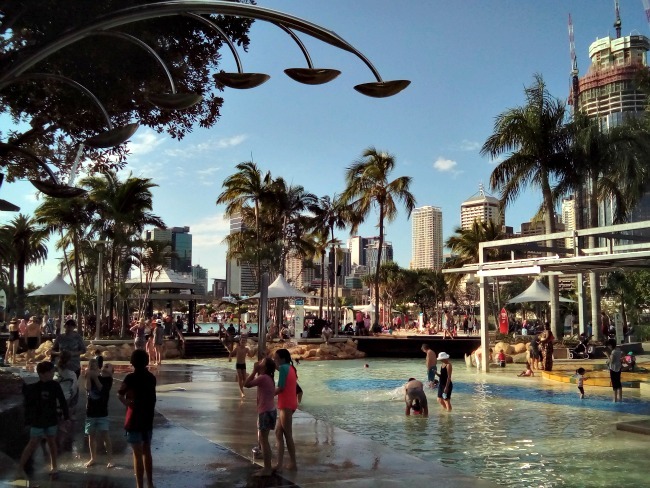 I’m currently looking into possibly visiting Brisbane next year and this post was super helpful to learn of different things you can do while in Brisbane! So pleased that you liked it. 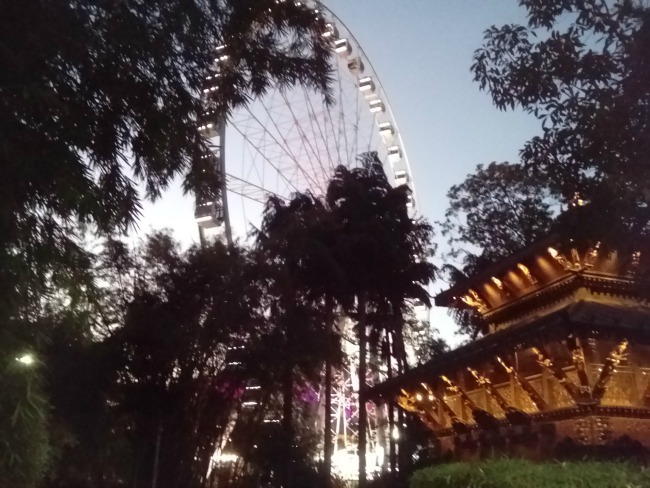 Brisbane is an amazing city. Just ask if there’s anything you need to know. Thanks I’ll definitely keep that in mind!